Stew, are you able to detail what synths you are using on the tracks you make and maybe deconstruct how you are using them/patches/etc? youtube is always your friend with these type of things. how are they working with the modular stuff? The keys has a pair of dedicated cv/gate outputs, which is great. I had to make some cables (stereo 1/4" to dual mono 1/8") to get it going, but once I fought my way through the setup in the keys it worked like a charm. You can also send a clock out, but it's kind of a dumb clock that hits once per measure? I ended up testing it out with a multiplier to get things moving. The RYTM also has individual outputs, and you have the option of a "pulse" output on each pad, so I used that one on my Happiness pedal, but that's all so far. Like a dumdum i loaned out both of my midi>CV converters. Can we post things even if we're not Stewart? Thanks, man. I flipped a LOT of other stuff, but I'm feeling pretty good about it. We'll see how the show goes, then I'll know for sure. i must admit to being slightly frightened by modular stuff, i'm worried that if i start i'll end up blowing THOUSANDS on it and/or end up selling my other synths to pay for it, and i don't want to do that. 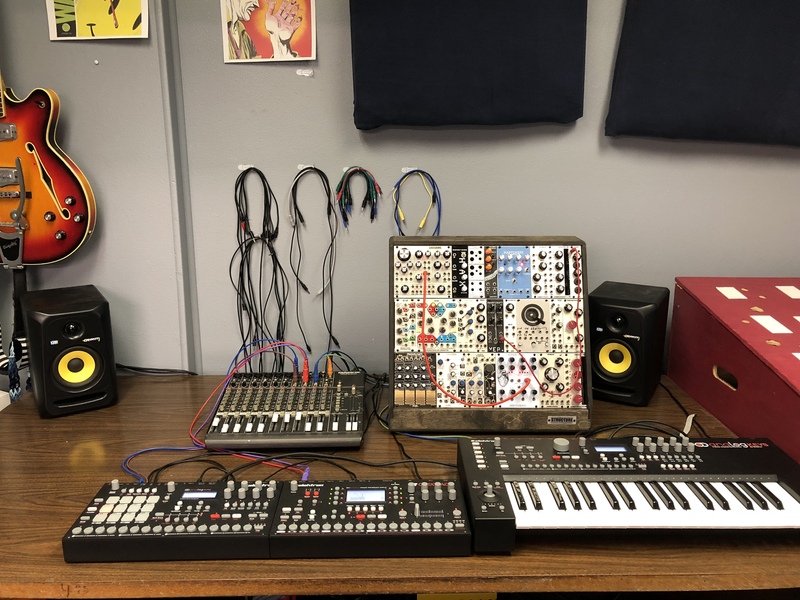 i keep thinking, "maybe just a clouds, a basimilus iteritas alter, a wasp filter and a couple of VCOs and that would be all i need" but i've heard enough friends exclaiming modular is like a crack addiction that i think i should just steer clear. uh, my problem is i never finish anything so i don't really have any recordings worth posting. the only finished/online track from the new damn teeth album just has a sequenced bass station and a casio organ sound on it, but there's a LOT of juno 106* on the other tracks, quite a bit of MS20, and i even managed to squeeze in FM synths once or twice. i borrowed a CV modded Korg 700S from a friend and we did some sequencing with it (sounds gnarly as hell) and a few other bits and bobs. great ring mod and the filter on it is really nice.